Hello my name is David Rowbottom I'm 63, I am enquiring if anyone has any reccolection of the fire at Wellington Mill, Hazel-grove owned by Novo yarns Ltd, In which my father George Rowbottom and two other men sadly lost their lives in 1947. I do rememmber a fire at the mill when I was a youngster and it was in the main mill - not the weaving shed. I will ask my friend in Anglesey what she remembers and see if I can find anything about it in my books on H.G. I am sure the library - either Hazel Grove or Stockport - would have a record of it. I do remember a fire at the mill when I was a youngster in the late '40's and it was in the main mill - not the weaving shed. I will ask my friend in Anglesey what she remembers and see if I can find anything about it in my books on H.G. I am sure the library - either Hazel Grove or Stockport - would have a record of it. Just a small piece about it in 1947. 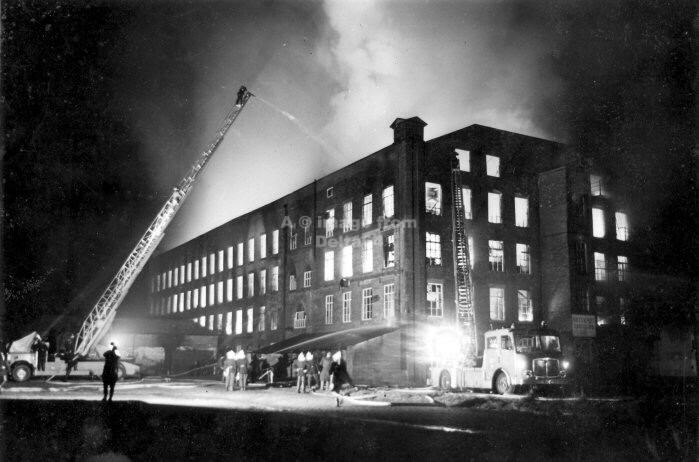 I remember the 60s fire at Wellington Mill,it was huge.Well done chslady for finding that info . Just joined . I am going through looking at menories. Gerry irlam who passed away several years ago was at this fire as was my father who had just been demobbed from the Royal Navy . My father was being trained at the time the men who lost there lives in that fire were /are heroes . I have seen photos of the fire somewhere on the web and shall try to find them. For now here is an aerial view from the Britain from above site. I finally found the image. The fire was 10th November 1964. I was there. I was 10 at the time and saw a wall collapse taking - I think it was two - firemen with it, into the flames. I am 81 now, so 1947 it is.